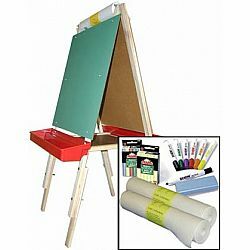 Built to last, our Ultimate Double-Sided Child's Easel includes a built-in paper holder and two large 24" x 24" art surfaces (green or black chalkboard, white markerboard or washable magnet board). Choose any two boards i.e. 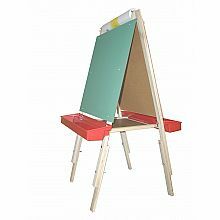 : whiteboard & whiteboard easel available (this option allows young ones to be on both sides with no competition for boards). 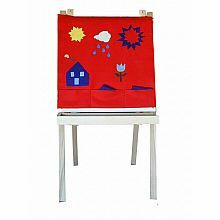 You also get to choose your choice of natural wood or red plastic paint/art trays, and every easel comes with a paper cutter! Add our optional Leg Extension Kit to make your easel adjustable! Giving it 4 different heights from 42" through 54". Leg Extensions may be ordered with your Ultimate Easel or added later. 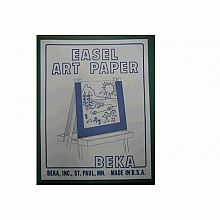 All BEKA Easel Combos come with: 2 - (100ft)paper rolls, 8 pk wipeoff markers, white & color chalk, and an eraser! 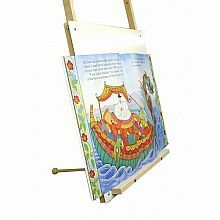 The most flexible of our double-sided easels, this natural hard maple easel comes with a top mounted paper holder that positions a roll of art paper above both art surfaces, where it is very accessible. This feature allows paper to stay in place even when the easel is folded for storage. 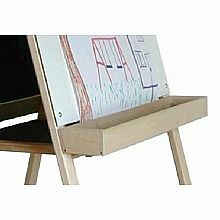 A center storage platform holds the easel securely open during use (creating a sturdy A-frame tough enough for heavy use); pivoting the center platform up and out of the way allows an adult to fold the easel after simply removing one paint tray. 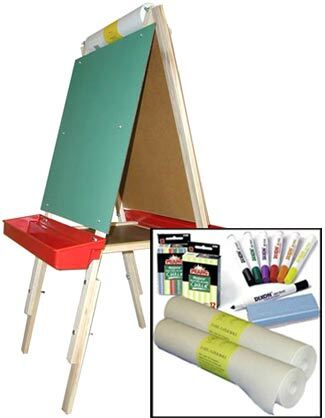 Our Ultimate Easel comes assembled and ready to use at a height of 42"; just add the paint trays. Weight 25-29 lbs, depending on options selected. Adult Assembly Required. Recommended age: 2+ years. 1) What is the difference between the Ultimate and Deluxe Easel? The difference is that the Ultimate starts at a shorter height (42") and has the option to add extension legs making the easel adjustable in height (with 4 different heights to choose from, up to 54") and the Deluxe Easel has one height (46-1/2"). 2) Can the Magnet Board also be used as an art surface? 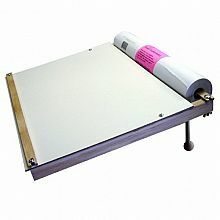 The magnet board is primarily designed for use with magnets. It is washable and can also be used with "high quality" dry-erase markers like the Dixon markers we sell (we recommend attention to cleaning regularly and diligently, as it is not as reliable a wipe-off markerboard as our standard markerboard). Always test markers in a corner for erasure before use. The magnet board is double-sided (thus can be flipped over). 3) Some pros/cons of the two tray options (red vs. wood): The red tray has a sharp look, can be cleaned/washed out with water, and is an inch taller than the wood tray. The wood tray has an all-natural look and is sturdier (it would take a hammer to break it as opposed to the more "flexible" plastic). You would not want to get the wood tray wet, so drawings on the trays need to be sanded off or simply enjoyed! Most people like the character and patina of a wood tray over time, almost making the easel itself a piece of art. 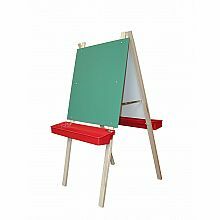 :) You can now order your easel with one of each tray (if you are undecided)! Measures approximately: 43.00 x 24.00 x 5.00 inches..